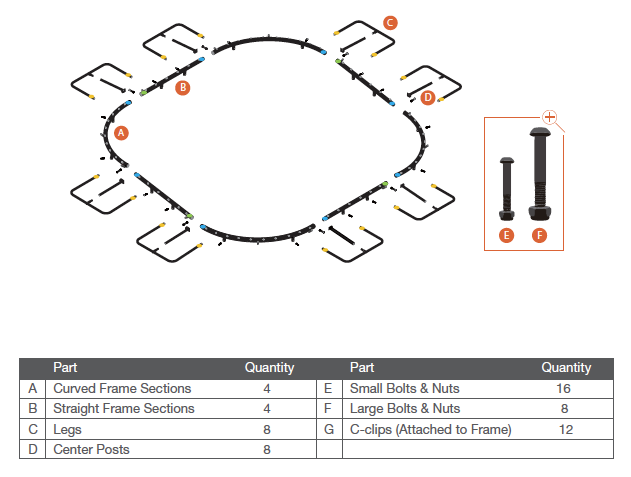 Lay out the remaining frame parts as shown. The coloured stickers all face upwards. If you are missing any parts, please contact Springfree Trampoline directly. WARNING - Use the tools provided to fasten the nuts. Do not over tighten the nuts. Do not use power driver, torque wrench, or drill. 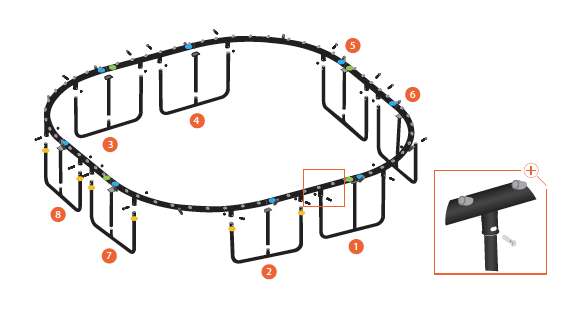 TIP - Fastening the final two frame sections often requires additional effort. Two people may be required for assembly. Connect and fasten one frame section at a time together with the large nuts and bolts. Then, in the order shown in the illustration, lift the frame and evenly put the legs into the leg hole on the frame. We recommend that two people work together to complete this step. One person to hold the frame up and horizontal, and the other person to put the legs into the leg hole. NOTE- Before proceeding, double check that all of the bolts and nuts are tightened. Use the tools provided to fasten the nuts. Do not over tighten the nuts. Do not use power driver, torque wrench, or drill. The blue tags on the mat should approximately align with the blue stickers on the frame. Locate the green tag on the bottom edge of the net and match it with one of the green stickers on the frame. Holding the net so that the green tag is facing you, gently place the rest of the net inside the frame as shown. DO NOT let go of the green tag. Put a white mat rod through the hole to the immediate left of the green tag in the net and then into the mat rod socket next to the green sticker. Then, working carefully around the frame, insert the remaining white mat rods through the net holes and into the corresponding mat rod socket. When finished, the net should be stretched tightly around the OUTSIDE of the frame. 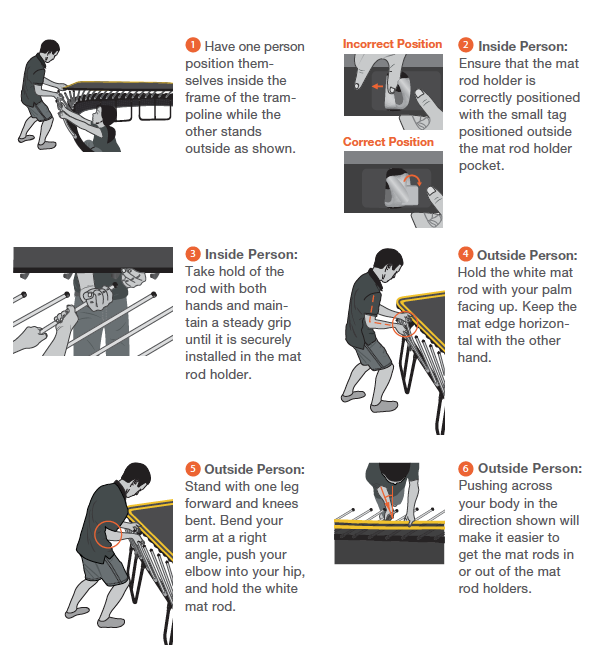 WARNING - Both people must maintain a steady grip on the rod until it is securely installed in the mat rod holder. 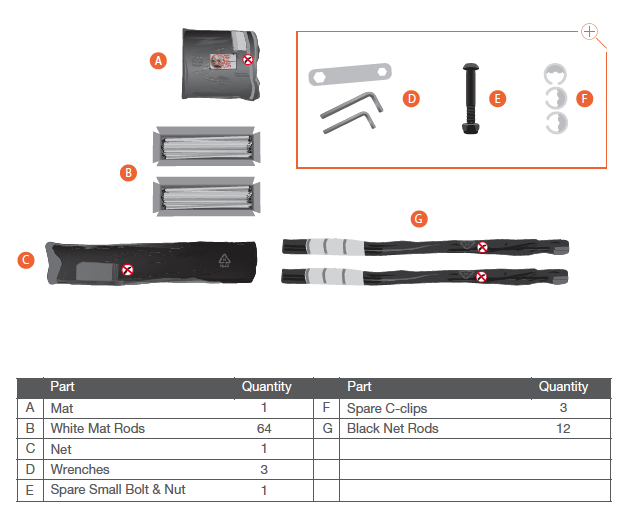 NOTE- Before you install the first white mat rod into a mat rod holder, read the instructions in Step 6B and 6C. NOTE- Two people are required for assembly. NOTE- Following the sequence shown spreads the tension evenly across the mat. If you do not follow this sequence, it will be very difficult to attach the mat. 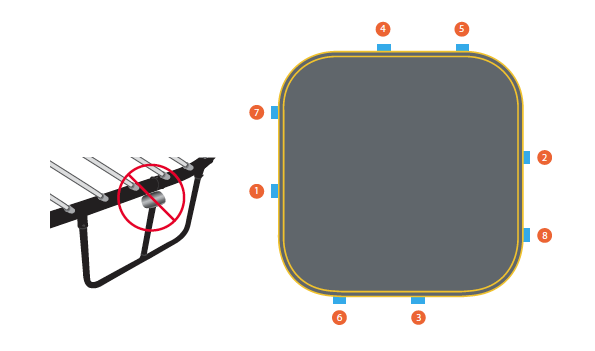 Check that the center posts of the leg sections are correctly seated under the trampoline frame. If they are not, adjust them now. Attach one white mat rod at each of the locations shown - where the blue tags on the mat match with the blue stickers on the frame. NOTE- Follow the mat rod installation sequence. Do not install multiple mat rods in one location. If you do not follow this sequence, it will be very difficult to attach the mat. 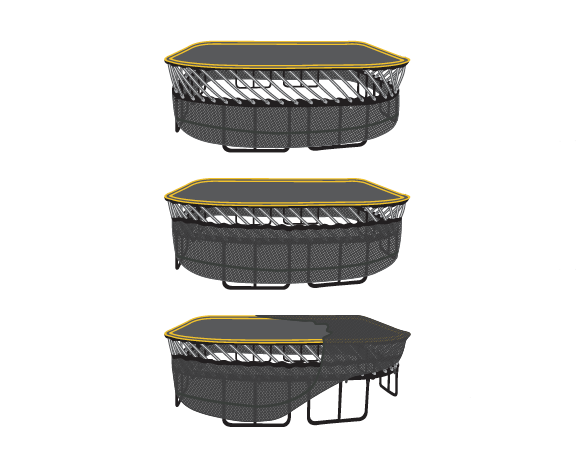 NOTE- Each time you circle the trampoline, check that the center posts of the leg sections are correctly seated under the trampoline frame. If they are not, adjust them before installing any more rods. You may need to uninstall rods to release the tension. Go back to the very first rod you attached to the mat in Step 6a. Now, moving clockwise, attach ONE white mat rod next to the initially installed rod. 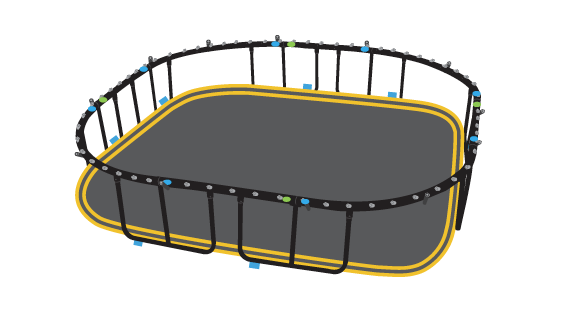 Moving clockwise around the trampoline, attach ONE additional rod next to each of the already installed rods as shown above. 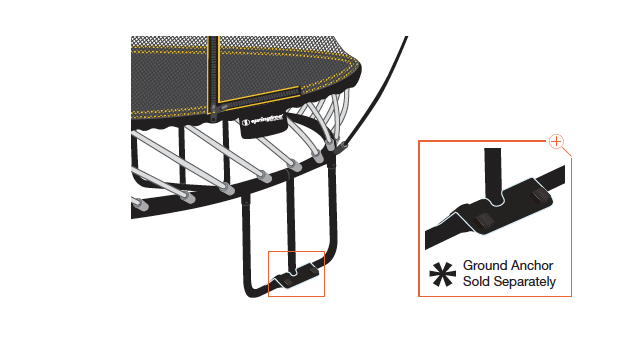 NOTE- Check that the net is not caught on the trampoline frame or the bolts – if the net catches, it may tear. Moving clockwise around the frame, carefully slide the net up to the top of the white mat rods. Working around the frame, lift the rest of the net into the center of the mat. 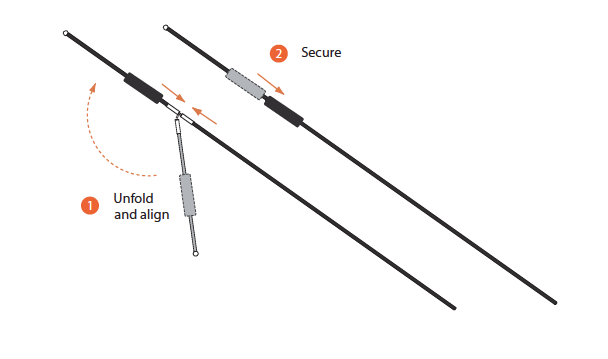 Ensure that the bottom band of the net is pulled all the way to the top of the white mat rods. 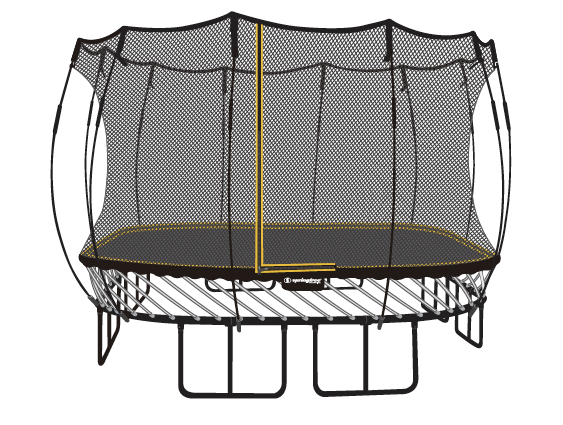 WARNING - Make sure you read all warnings and precautions found in the User Guide before using the trampoline. WARNING - If you anticipate severe weather, consider lowering the enclosure, moving the trampoline to a sheltered location or disassembling the trampoline completely. If your trampoline is installed in an area susceptible to high winds or if you are looking for increased stability for your trampoline, we recommend the Springfree Ground Anchor, which has been designed specifically for the Springfree Trampoline. Ground Anchors can be purchased online here. Congratulations! You have successfully installed your Springfree Trampoline! Happy bouncing!.